Entering Issue Transactions in Incident allows you to track the inventory cost on your incidents as well as monitor your inventory levels in Inventory. These transactions open up reporting doors to help you see where resources have been allocated. On the incident form, scroll down to the Transactions section and click on New Issue Transaction. On the Add/Update Issue page, identify the Type of inventory from the drop down list. (Building Management Systems, Controls, Custodial, Electrical, Mechanical, Other, or Technology) *Note: Technology will be selected by default, but another type can be selected if needed. If the costs of this item will be associated to a Budget Code select it from the drop down list. Click Submit to save the transaction to the incident which will also create an Issue Transaction in Inventory. 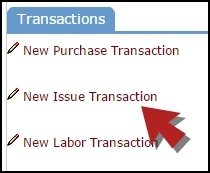 To edit or delete an Issue Transaction, click on the Item Number field from the Issue Transactions section of the incident.